The Cesky Terrier exists due to the efforts of a Czech breeder, František Horák. The Cesky is a relatively new breed, first recognized by the FCI in 1963. The Cesky Terrier was recognized by the United Kennel Club on January 1, 1993. They are a mixture of Sealyham Terriers and Scottish Terriers. The Cesky's original purpose was to hunt vermin in their dens, especially rats and foxes. The Cesky Terrier, also called the Bohemian Terrier, is a short-legged, moderately long, terrier. It looks similar to a Sealyham Terrier. 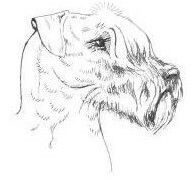 The Cesky Terrier has a long head, bushy beard, mustache, and eyebrows. The body is solid, but not heavy. The Cesky Terrier is agile and robust. The wavy, silky coat usually comes in various shades of gray-blue with tan, gray, white, or yellow furnishings or light coffee, though puppies are born black. The coat lightens between birth and two years of age. The Cesky Terrier's eyes are brown in gray-blue dogs and yellow in brown dogs. The noses and lips of blue-gray dogs are black; for brown dogs it is liver. The ears are triangular, folding forward close to the head. The head is long, but not too wide, with a well-defined stop. This is a sweet and happy dog that is good with children and tends to be less dog-aggressive than some other terrier breeds. Patient and brave, they are loyal, obedient, and courageous dogs. They are intelligent and more trainable than many other terriers. They are easy to handle. They love people, especially children, and are fairly friendly with strangers, but like most terriers, are feisty, stubborn, and fearless. The Cesky Terrier is energetic and enjoys running and playing through a wooded area or open countryside. They also enjoy a long walk on the lead.